Maiko Nizzo joins Casa Cool Beans team to become the first Les Clefs d'Or Concierge at a Rio de Janeiro Guesthouse! Hi, my name is Maiko and I am a Carioca (born in Rio de Janeiro). Raised in Copacabana, I am passionate about Rio de Janeiro. I consider myself a lucky guy to live in one of the most beautiful cities in the world and I feel extremely fortunate to have a job that focuses on helping people enjoy this “marvelous” city! After working a few years as a Concierge for some of Rio’s most popular hotels, I began attending meetings of the most respected international Concierge associations, the Les Clefs d’Or. A few years after that I was awarded the coveted golden keys, making me an official member of the Les Clefs d’Or Organization. You can recognize Clefs d’Or Concierges by the keys they display on the lapels of their uniforms. These crossed gold keys are more than just the symbol of the organization; they are the symbol of guaranteed, quality service. Les Clefs d’Or, pronounced, “lay clay door,” is French and literally translates as “keys of gold.” Les Clefs d’Or members have dedicated many years of hard work and training to the concierge profession. They have their fingers on the pulses of their cities, able to advise guests on restaurants, nightlife, sporting and theater events, sightseeing tours, shopping and more. They can direct guests to any location, any product, at any time of day or night. Les Clefs d’Or concierges are motivated by a genuine desire to serve. Whether requesting something simple or complex, you can be sure they are a trusted resource to business travelers and vacationers alike. Always keeping guests’ safety, enjoyment and satisfaction in mind. While attending an international concierge congress in Canada, I met several Les Clefs d’Or members working in small properties, which for me was new and very interesting! So, after returning home, I began to think that maybe it was time for me to do something different. So, that is exactly what I did last week when I joined the Casa Cool Beans team. Now, for the first time in history, a guesthouse in Rio de Janeiro has its own Les Clefs d’Or Concierge. 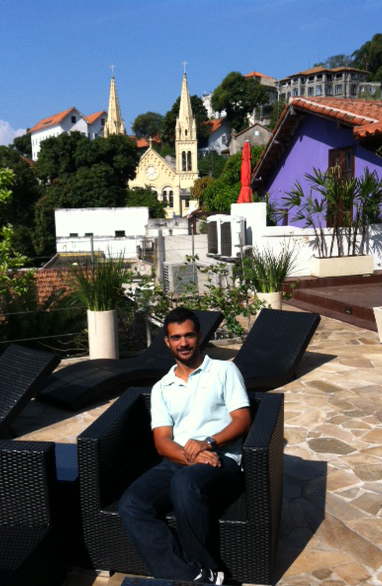 I am a very lucky guy to receive the opportunity of working at “TripAdvisor’s Best Guesthouse 2012 Travelers’ Choice” of Rio de Janeiro! The team at Casa Cool Beans, owners Lance and David, manager Sergio and the rest of the staff are already doing an excellent job. I feel honored to be part of this outstanding team! As the first Concierge at Casa Cool Beans I will do my best to assist guests to enjoy the city and give them the best tips possible so they can become adamant fans of Casa Cool Beans AND the city of Rio de Janeiro!